A new facet in the David Petraeus scandal has unfolded as it emerged that Paula Broadwell once modeled and served as spokeswoman for Kriss Arms, a Virginia Beach machine gun production company. Paula Broadwell is featured in an advertisement for Kriss Arms, where she leans on years of military research and her shooting savvy to praise the design of the guns. Her proximity to David Petraeus, one of the highest-ranking members of the American military, and her commercial endorsement of a gun manufacturer will appear suspicious and likely add more fodder for federal investigators. The commercial was posted in March of this year, at the same time she was reportedly having an affair with the then-CIA director who previously was the head of U.S. military command in Afghanistan. “Clearly computer technology cannot solve all the problems in modern warfare, for example a computer can’t come up with a strategy to win a war. Neither can a computer or technology galvanize unity of effort which is critical in these wars… those are all human efforts. It can be empowered and enabled by technology but it comes down to human endeavor at the end of the day,” Paula Broadwell says in the video. Producers of the video included that she was the author of General David Petraeus’ biography as the justification for her participation on screen, and while she did not explicitly mention her lover by name, it is clear that she was thinking of the man she repeatedly called an “inspirational figure”. In portions of her interview, Paula Broadwell uses her military background to justify the improvements made by Kriss Arms. “On the individual fighter, reducing weight is critical because of fatigue and stress. Weight reduction can greatly improve the efficiency of a firearm,” she says. Paula Broadwell doesn’t simply rest on her brains when it comes to touting the company’s guns, however, as she is seen using one of their models to shoot at targets in a Virginia Beach range. During one segment, she successfully hits four targets out of five consecutive shots. David Crane, who is also featured in the six-minute video, told The National Enquirer that he took particular notice of the mother-of-two when she changed out of the professional clothes she was wearing and slipped into something more befitting the shooting range. “She changed into those tight jeans and riding boots specifically to shoot guns at the firing range,” David Crane said. 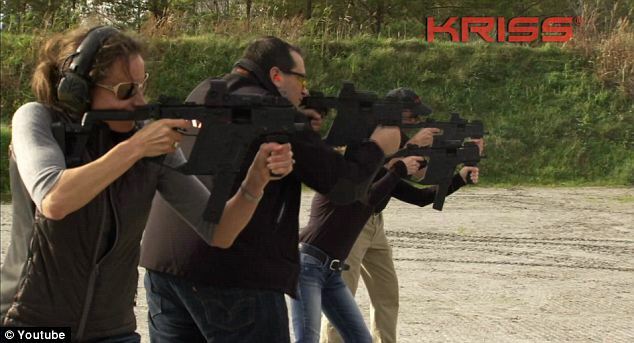 There is no denying the connection between Paula Broadwell and the machine gun company, as she apparently posted about her time as a “model/demonstrator” for Kriss Vector on both her website bio and her LinkedIn profile before making them private once the scandal hit. The company is now keeping their distance, however, as the CEO John Spurrier downplayed her involvement. “Mrs. Broadwell did participate as a subject matter expert and demonstrator… about the company’s products, but has never had any official affiliation with the company,” he told ABC News. Now the only posing that Paula Broadwell is doing is that of the reluctant troublemaker, as she has been seen going to and from relatives’ homes in Virginia and Washington, D.C.